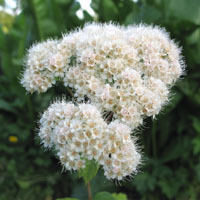 This spirea has dome shaped white flower clusters that attract butterflies. It looks great added into a shrub border. Occurs throughout the Puget Sound region.